With winter winding down (…maybe? ), we’ve been itching to get away to soak in the last of this snowy season. One of the best parts of living in Glens Falls is the proximity to places that feel a world away, but in reality are a quick drive from home. Case in point: the southern Adirondacks of Warren County. Within 40 minutes, we found ourselves winding through the mountains, between lakes and along the Hudson River. We were excited to be reminded how much the western portion of the county has to offer, especially in the winter. While Gore Mountain is a major draw, relaxation (okay, and eating) was the name of our game, and we’re looking forward to sharing some of our favorites from the North Creek / Chestertown / Warrensburg area with you! 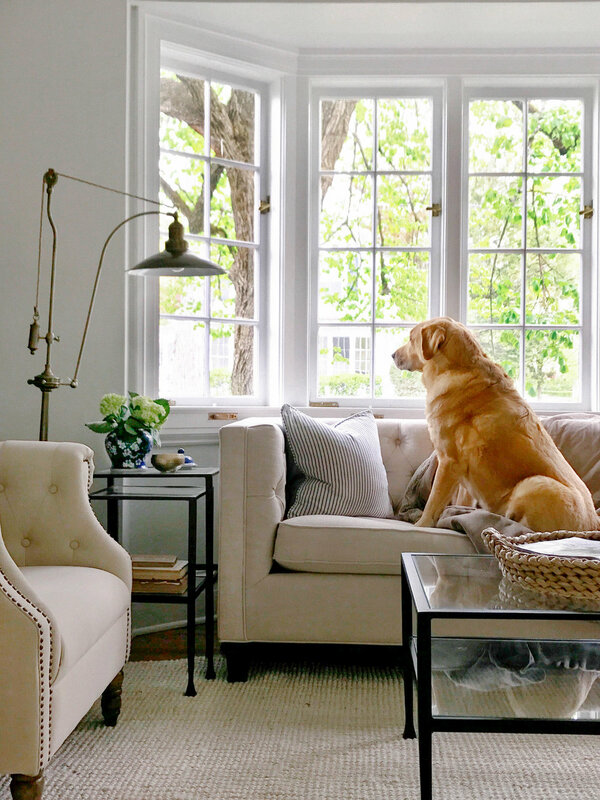 The Fern Lodge | On Friends Lake in Chestertown | Fern Lodge is one of those places that instantly feels like home (Shadow, the sweet yellow lab as the lead member of the welcoming committee sure helped!). We entered to a roaring fire in the stone fireplace of the great room, a snowy lake view out the back windows, and the cheerful welcome of the owners, Sharon and Greg (and their adorable labs, Shadow and Noche!). The lodge has just five rooms (each with their own fireplace), which makes it the perfect place for a quiet getaway, or the perfect place to enjoy some wine and conversation with other couples! We opted for a bit of both and ended up having the very best time. It felt a bit like we’d rented our very own Adirondack camp for the weekend (and like we’d won the vintage rug lottery - couldn’t get over the amazing collection throughout!). Each room is completely different, and though I hate to play favorites, check out the amazing bed in the Pine room! We both left feeling like we’d gotten away for a week, despite just staying one night. We can’t wait to go back to experience the property in the summer, with a glass of wine in the Adirondack chairs overlooking Friends Lake below. Oh, and how could I forget - a ride in their boat! Coffee + Pastry | Cafe Sarah | North Creek | The first sign that caught our eye on our drive into North Creek, Cafe Sarah was just as cute inside as it is outside. The perfect spot to pop into for a coffee, and once at the counter, we couldn’t pass up a maple glazed cinnamon roll. SO good. Everyone deserves a second breakfast on vacation, right? Lunch | Main Street Ice Cream Parlor | Chestertown | A must! Our first time here was this past fall, and their breakfast was so good that I contemplated hanging around until lunch ;) Needless to say, we were excited to come back for sandwiches (and just to spend some more time in this amazing space - it’s straight out of the pages of Country Living Magazine!). We both ordered the grilled cheese, which was perfect with their addition of red onions and tomatoes. We didn’t have room left for dessert, but that gives us an excuse to come back again soon! Sweets | Izzy’s Market & Deli | North Creek | We love a good old fashioned country store, and Izzy’s gave us all of those warm and fuzzy vibes as soon as we walked in. From the old tin ceilings to the beadboard walls and creaky wood floor, it’s everything you’d want in a small town store. It looked like the perfect spot for a coffee or a sandwich, but we made a bee-line for the chocolate chip cookies on the counter (which, by the way, were amazing. And huge!). More Sweets | Barkeater Chocolates | North Creek | Since we can never get enough sweets, we couldn’t pass up the opportunity to swing into one of our favorites - Barkeater Chocolates. Tom loves their Sea Salt chocolate bars, and after trying a few free samples of the Black Bear bar - we had to pick up a couple (made with black raspberry and black pepper - so unexpected and so good!). Dinner + Drinks | barVino | North Creek | The place to go for dinner in North Creek, we had heard so many great things about barVino and couldn’t wait to try it. A beautiful space, with a fireplace and tables on one side and a lively bar on the other. We lucked out with a spot at the bar and enjoyed the perfect dinner of small plates and wine. Our favorites: the deviled eggs (amongst the best we’ve ever had!) and the deep fried Brussels sprouts (…and the frites..and the hummus..oh! And the bread!). Can’t wait to go back again soon (and we’ll snap some photos next time - it’s easy to forget about photos with five plates of delicious food in front of us)! Snowshoe | Since I don’t ski (I know, I know), snowshoeing has always been my winter sport of choice. We were so happy to learn that we could just slip on our snowshoes (Fern Lodge has some you can borrow if you don’t have your own), and snowshoe off the beach onto the frozen lake below the Lodge. We lucked out with a gorgeous sunset, and as beautiful as it was in the snow, we couldn’t help chatting about how pretty it must be here in the warmer months as well. And what could be better than catching a glimpse of the smoke coming out of the chimney at the Lodge as we made our way back, and knowing a fire and a glass of wine were waiting for us?! On our list for next time: ski lessons at Gore Mountain, just about 25 minutes away from Fern Lodge! Deadwood Mountain Trading Company | Warrensburg | Is there anything better than a Bernese Mountain Dog as a shop greeter? Sweet Leica (named after the camera!) the pup met us at the door at Deadwood Mountain Trading, and she was as beautiful as the goodies in the shop! Stocked with gorgeous pieces from local artists, this is definitely worth the stop if you’re in or around Warrensburg! The Foothills | North Creek | One peek in the windows and we knew this shop would be a gem. A perfectly curated mix of new and vintage, and one of those places where each time we walked towards the door to leave, something else caught our eye. Loved those red galvanized trays (and the stools underneath!). Hudson River Trading Company | North Creek | Housed in a restored 1898 building (with the original horse stable in the basement! ), Hudson River Trading is chock full of quintessential Adirondack home goods and clothing. Stocked with favorites like Hudson Bay, Woolrich, and Pendleton, they also had plenty of vintage pieces (like those snowshoes! 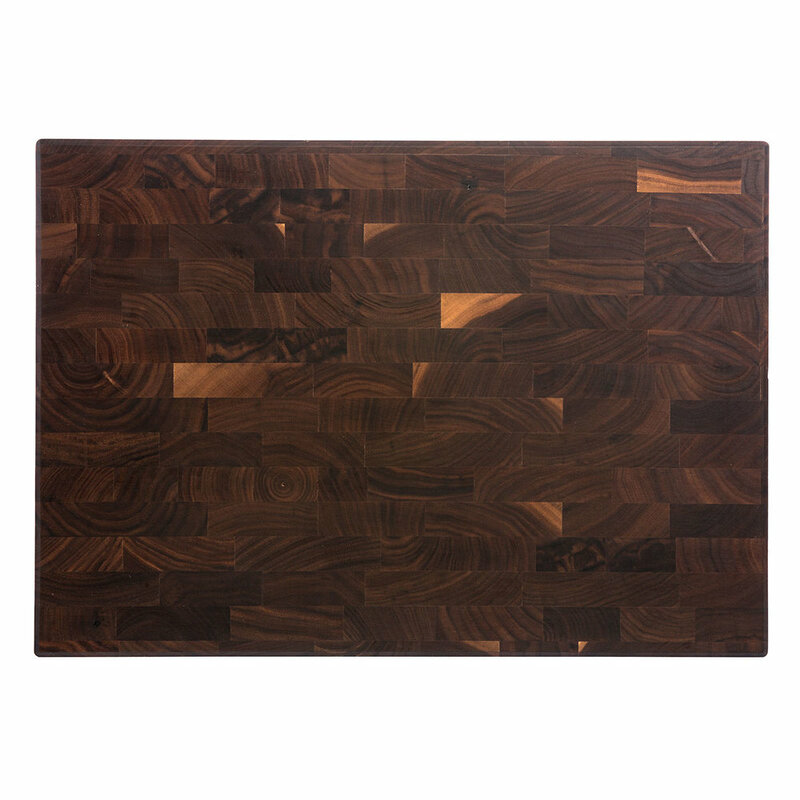 ), and basically everything you’d need for the Adirondack camp of your dreams. Panther Mountain Traders | Chestertown | If you thought the log cabin exterior was beautiful, wait until you see the beautifully curated collection inside Panther Mountain Traders. We love the vintage inspired pennants, and wanted to take home pretty much everything you see on that table below (those wooden bowls, in particular!). Just down the road from Main Street Ice Cream Parlor, this is the perfect place to shop off some calories from lunch! Can’t wait to re-trace our steps again this spring and summer to see the area in a new light. Have any North Creek / Chestertown / Warrensburg favorites? We’d love to hear! *This post is in partnership with our friends at Warren County Tourism and VisitLakeGeorge.com, a destination close to our hearts and just outside our door. Thank you to The Fern Lodge for welcoming us as their guests. We’re always thrilled to discover these nearby gems. After immediately recommending this trip to family and friends, we’re thrilled to pass along the tips to you! Thanks for supporting the businesses that support The Yellow Note. Well, that’s a wrap on January, and I can’t help but be excited that we only have 42 days until spring. It’s not that I’m not a winter person, but I’m so much more a rest of the year person. January was all about both Tom and I catching colds, getting over colds, and just being cold in general ;) You know it’s bad when the dogs don’t even want to go for a walk, and we’ve happily obliged. That said, we’re all starting to get a bit of cabin fever, so we’re spending our time by the fire dreaming up some winter adventures to get us out of the house lots more in February. Favorite Road Trip | We finally got the Wagoneer back on the road this month (back on the road without spewing a black cloud of smoke behind us, that is), and took our first day trip out of town over to Manchester and Dorset. A few covered bridges, quick stroll by the pond, a general store, and a giant chocolate chip cookie for the ride home. Always a day well spent. Here are some of our top picks from the Manchester area, if you’re headed that way! Favorite Moment | Starting off the year with a new business partner! Tom joined the business full time late last year, and I could not be more excited. He’s been helping behind the scenes for so long and I’m so happy to have extra hands on deck to be able to take on some new projects (let us know if we can help you! ), and we’re also working on a little something special for our own hometown (sneak a peek at what we’re up to with that here). Favorite Book | One of my goals in January was to read ONE book. Just one! No such luck (insert face palm emoji here), but this book is sitting at the ready on my nightstand and I can’t wait to dive in. Favorite Seconds | I’m keeping my word from this post and sharing some of our seconds from our One Second Everyday project with you here. It didn’t take long to get back in the habit and I’m so happy to have these little moments documented again, no matter how ordinary. “So…The Yellow Note. You mean like a post-it?” The conversation inevitably goes there when I introduce myself and business. I figure most people must envision those yellow sticky notes, haphazardly stuck above an office desk, and piling up in the trash can once the task written on it has been completed. But, the yellow notes I’m referring to are worth keeping. In fact, I’ve got a shoebox full of them that I’ve been collecting since before I could read. I started my business back in 2013, after a few degrees and a career in social work left me longing for a creative outlet. Deciding to start my own thing was easy, but what held me back was deciding on a name. Back then, I was starting an Etsy shop and selling stationery and custom address stamps. I wanted something catchy and cute, but turns out, so did everyone else. The domains of most of the names I thought of were taken, and when something wasn’t, I just couldn’t commit to it. There was no connection there. And I wasn’t just looking for connection to a business name. I wanted the shop (and now, creative studio) to actually provide connection for others, be it through a handwritten note that they addressed using one of our address stamps, or now, through our photography and Instagram, a connection to a place they used to know or longed to visit made through a photo we’ve taken. A connection to one another, to the simpler things, the little things, the everyday moments. In a world where we can connect all day via iPhones and Instagram, I longed for sweet and simple connections made the old fashioned way. Like coming downstairs in the morning as a kid, after my dad had left for work, and finding a note on the table, just for me. “You’ve worked so hard studying for this test. You’ll do great!”. “Good luck in your game today - I’ll be there right when I get out of work!”. And there it was. The notes my dad has been writing for me since I was little. Most of them written on yellow note paper. Connections made, the old fashioned way. Moments captured via yellow note. A shoebox full of nostalgia. Simpler times. Happy moments. Words of encouragement and love. Just like the yellow note delivery has changed over the years (my dad hand writes the notes and texts me a picture of them, and delivers a hard copy later :), The Yellow Note as a business has evolved as well, from stationery to photography and creative consulting. But, the meaning and purpose of a yellow note will always remain - connection - and one of my favorite parts is connecting with all of you. So, thank you. It means so much to have you along for the ride. And thanks for all the notes, Dad. Love you! Foliage season is one of my favorites. Okay, it’s definitely my favorite. The food, the colors, the cozy fires. If you blink, you might miss it, and that’s why we like to stretch our enjoyment of the season as much as humanly possible. Come September 1st, I’m glued to the foliage forecast websites. We start the season peeping the foliage in the High Peaks region of the Adirondacks, followed by Vermont from north to south, and around mid to late October, we’re finally able to enjoy the peak colors a bit closer to home in the Lake George region of New York. Last weekend, we packed our favorite road trip snack - Cape Cod Potato Chips - and made a day trip up the western shore of the lake. Read on for a few of our stops along the way! Hike | The Pinnacle | A popular local hike, this is a quick one with an amazing view. We lucked out with the lookout to ourselves, and as we sat there, the first snowflakes of the season began to fall - pretty magical! Since it’s just not possible for us to hike without a snack, we couldn’t help but open up our Cape Cod Potato Chips to enjoy just a few before we stopped for lunch later on. See | Sabbath Day Point Overlook | As you make your way up Route 9N (Lake Shore Drive), you’ll pass Northwest Bay (one of our favorite spots for a quick paddle! ), and after winding your way through a colorful forest, you’ll find yourself back on the shore at an expansive lookout of the northern portion of the lake. We’ve stopped here dozens of times, and the view never gets old. Stroll | Silver Bay YMCA | It’s been on my list for ages to pull off and explore the Silver Bay YMCA (founded in 1902 and on the National Registry of Historic Places!). We finally made the stop and I’m so glad we did. With stunning views of the lake and historic buildings dotting the property, this is definitely a place I could spend a full day exploring. We are already excited to come back in the summer months to take advantage of the canoes and kayaks. This trip, we were pretty happy just pulling up a couple of Adirondack chairs and enjoying the view and a few leftover Cape Cod Potato Chips before we got back on the road. Breakfast | Bolton Beans | We love the nostalgia and charm of this 1946 Service Diner. Though we opted for a light breakfast sandwich to fuel our morning hike this time, the pancakes and omelets are in our regular rotation here. This is a popular spot amongst locals and tourists alike, so if you go during busy season, get there early to snag a spot! Lunch | Hague Market | While Vermont tends to get all the love for its country stores, we have a hidden gem tucked right into our own backyard. 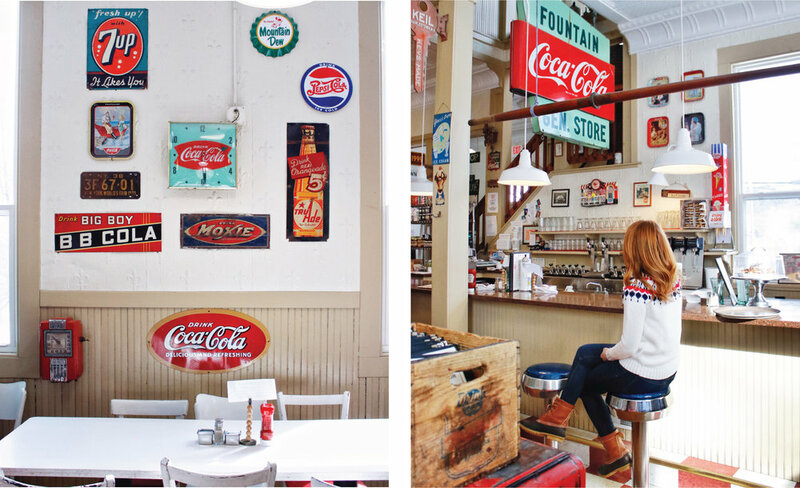 The Hague Market is the Adirondack’s oldest running general store, and the perfect spot to grab a couple of sandwiches, sodas, and peanut butter cookies for lunch. We brought along our trusty Cape Cod Potato Chips, and while Tom had already eaten half the bag, we somehow managed to have enough left to enjoy with lunch (which by the way, we ate in the Hague Town Park across the street while enjoying the prettiest view!). Antiques | We’ll brake for antique shops and barn sales, always. A couple of our regular stops in Bolton Landing are Black Bass and Lakeview Antiques, and while we didn’t have time this trip, we’re itching to get up to Longergan’s Antiques in Ticonderoga. Would love to hear your Lake George area favorites! And I’m sure Tom would love to hear your favorite road trip snacks ;) Until next time, Lake George! This post was in partnership with Cape Cod Potato Chips, a brand we’ve brought along on many a road trip over the years. Thanks so much for supporting the brands that support The Yellow Note! After a summer spent close to home (and an unexpected hiatus for our Wagoneer as it awaits a new engine), we were itching for a mini road trip this month. We made a quick trip to Cooperstown last fall, but the one thing on our list that we didn’t have time for was a stop at Brewery Ommegang. So, with the forecast calling for sunny skies and 80 degrees, we decided there was no better location for a quick adventure. You know your destination is going to be good when you wind up using barns as landmarks along the way. We oohed and ahhed at the farms, fields, and views along our drive, and upon pulling up to the farmstead Brewery, with its welcoming white archway framing the rolling hills behind it, we immediately decided that a trip back during foliage season is a must. 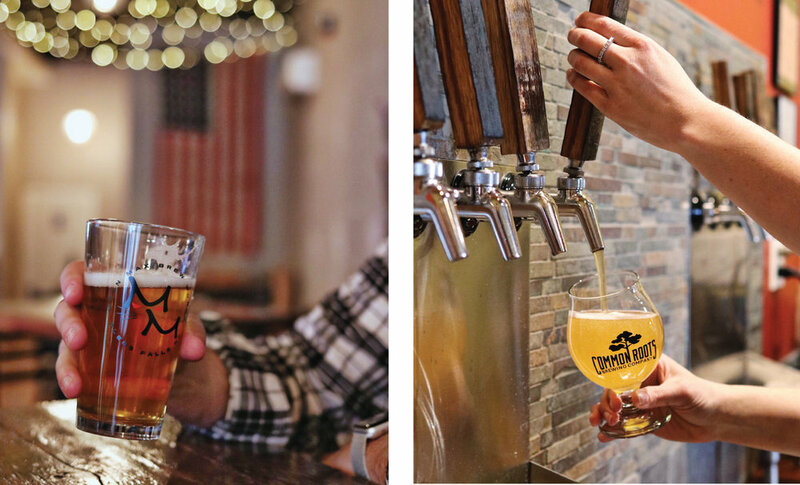 If you’re looking for a mini road trip destination this fall, read on for our favorites from our trip to Brewery Ommegang. Café Ommegang | First things first - after a couple of hours on the road, we were ready for a bite to eat, and of course, a beer! Brewery Ommegang just recently renovated its Visitors’ Center + Café and we were excited to enjoy it from a table under their new outdoor pavilion, with views of the hills and hops behind us. We picked our favorites after a flight (Witte for me + the Nirvana IPA for Tom), and ordered some snacks, which we quickly devoured before our tour. Don’t miss: the frites! Served with truffle mayo, garlic aioli, and my fav - the sun-dried tomato pesto - they were gone in an embarrassing amount of time. The Grounds | The brewery grounds are a destination in and of itself. With no shortage of space to roam, we grabbed our beers, sipped, and strolled. A quick walk up the back hill had us exploring the rows of hops, and two pretty perches await for you to rest and take in the view of the brewery below. Highly recommend for sunset! Tour + Tasting | It wouldn’t be a visit here without a behind the scenes look at the brewing process and an even more extensive sampling of their beer. We found new favorites (Fruition for me, Hopstate for Tom), and of course, made our way into the shop afterward to grab some to take home. Get there early on weekends, because tours + tastings filled up fast! ﻿Don’t miss: the events! Firepit Fridays with live music, drink specials and you guessed it - a bonfire; Brunch Bingo on Sundays, complete with a beermosa (yes, please! ); and Bed and Brew - an exclusive craft beer experience in collaboration with The Inn at Cooperstown, including a beer and food pairing dinner (sign me up!). I already have my eyes peeled for their concert schedule next summer - Nathaniel Rateliff & The Night Sweats played there this past summer and I can only imagine what a fun show that must’ve been! And lastly, please oh please, drink responsibly, and arrange for a designated driver or a ride back into town if you’re planning to indulge. Brewery Ommegang recommends A & D Taxi or Uber. *This post was in partnership with our friends at Brewery Ommegang, a destination we’ve had on our list to visit for years. We were thrilled to finally make the trip and it exceeded our expectations. We’ve since recommended it to our friends and family, and happily now, to you! Thanks for supporting the businesses that support The Yellow Note. Having never been to the Mad River Valley, we weren’t quite sure what to expect as we rolled along (or shall I say squeaked along - in the Wagoneer) toward the village of Warren. As soon as we turned onto Vermont's Route 100, we knew we were in for a treat. We fell in love with Warren almost immediately, as we passed by a covered bridge and a barn before pulling up to The Pitcher Inn, just across the street from the local general store. With all of my favorite things in one little place, I could tell this was going to be a perfect weekend. Read on to see our top picks from this trip, and if you have any recommendations for our next trip, we'd love to hear! The Pitcher Inn | Nestled in the heart of the village next to a hillside brook, the Inn is what dreams are made of. Filled to the brim with character, each of the eleven rooms have a different theme - some playful, some historic, but all gorgeous in their own way. There are no shortage of cozy nooks to relax in - from the front and back porches, to the Adirondack chairs on back lawn, to the balcony we were lucky enough to have in our room. Even the dining room had a comfy leather couch to relax on while we finished our drinks. We stayed in the Coolidge Room, with the former President keeping watch from above the nightstand. Our balcony looked out over the village and was perfect for enjoying a glass of wine as the sun began to set. The light in this little valley was magical, and we couldn't help but linger in all of the outdoor spaces, enjoying the sound of the brook flowing by. We're already dreaming about a trip here in the fall - I can only imagine how beautiful the foliage will be (and how cozy the wood burning fireplaces would be in the cooler weather!). Breakfast | The Pitcher Inn | Included with the stay at the Inn, we loved waking up each morning to spend an hour lingering over our breakfast in the dining room (though we wished the weather were just a touch warmer, so that we could have enjoyed it outside on the porch!). The warm muffins to start were such a treat, and we loved all the healthy options (though we were seriously tempted by the French toast and pancakes each day - next time!). Lunch | Warren Store | The place to go for sandwiches + chips come lunchtime. Head to the back of the store to place your order (and don't forget a cookie for dessert), and take it outside to eat overlooking the brook. You won't regret it. Sweets | The Sweet Spot | A coffee shop, a bakery, an ice cream shop, and a bar - all rolled into one. So basically, a dream! We stopped here in the early afternoon, and enjoyed cookies and drinks (local craft beer and rosé!) on their patio overlooking the covered bridge. It just doesn't get much better than that. Dinner | American Flatbread | One of the highlights of our trip, for sure - American Flatbread is a must. I'm going to go ahead and call it the best pizza I've ever had (we got the sundried tomato and mushroom). Plus (and this is a big plus), it's located on a farm complete with red barns, lush green fields, Adirondack chairs and bonfires to enjoy in the evening. It does get busy on weekends, so your best bet is to arrive early to put your name your name on the list and enjoy your drinks on the lawn while the sun sets behind the trees. Dinner | 275 Main | Located at The Pitcher Inn, we loved being able to spend the entire evening on property - from enjoying a bottle of rosé on our balcony, to a delicious dinner in the dining room, and on to drinks on the back lawn. Our picks: the Cavatelli pasta (get a double portion! ), and the Halibut. And don't leave without dessert! Perfection. Cocktails | Tracks | The coziest tavern, located downstairs in The Pitcher Inn, Tracks was the perfect place to grab a pre or post-dinner drink. We claimed the Adirondack chairs on the back lawn to enjoy our drinks most of the time, but the comfy seating around the fireplace inside was perfect when the evening got a bit too chilly. Our drinks of choice: the A&M Manhattan + a glass of rosé, of course. Drive | With amazing mountain views in every direction, there are certainly no shortage of scenic drives around these parts. We picked up a map from The Warren Store that showed all of the scenic routes in the area, and enjoyed a sunny afternoon cruising along the dirt back roads. Big red barns, rolling hills, and a lot of conversation about how we could most definitely live here. Don't miss: the drive down Common Road. Stop by Mountain Valley Farm for fresh eggs and honey and enjoy the amazing mountain views beyond. Shop | We didn't leave too much time for shopping this trip, but we did make sure to pop into The Store, which was filled with the best collection of kitchenware (and a great selection of antiques upstairs!). Of course, we also made multiple trips to The Warren Store, just across the street from the Inn. An amazing craft beer selection, and an upstairs filled with gifts and Vermont made treasures. Hike | Without a lot of time for a longer hike, we were in the market for a trail with a little effort and a big view. Sunset Ledge fit the bill perfectly. We packed up some drinks and some Jack's Snax trail mix from The Warren Store and set off on a (mostly easy, aside from a few steep switchbacks to start) hike to the viewpoint. About 30 minutes later, we emerged from the trees to an amazing view (and all to ourselves!). Known for it's sunsets - and I can see why - it's gorgeous at any time of day. A huge thank you to The Pitcher Inn for welcoming us as their guests. As always, all opinions are my own. While we’re lucky enough to live about 20 minutes from this pretty city, we don’t get down here nearly as much as we’d like. So, since Tom and I were celebrating the 10th anniversary of our first date (which just so happened to be in Saratoga! ), we figured it was a perfect time to get away for a little staycation to check out our old favorite spots as well as see what’s new (hint: SO much!). First things first: 24 hours is nowhere near enough time to see and do all that Saratoga has to offer. Even just reaching out to a few people for recommendations gave me a list a mile long of restaurants to try, drinks to sip, and things to do. We could put together a 24 hour Saratoga guide every month and it would look completely different and be just as much fun as the one before (in fact, maybe that’s a good idea…!). That said, read on to find out where we stayed, strolled, and dined during our short but sweet 24 hours in Saratoga, and we’d love to hear your favorites for our next trip! Saratoga Arms | A beautifully restored Second Empire brick building AND a perfect location right on Broadway: win-win! We were smitten with the wrap around porch from the moment we arrived - perfect for our morning coffee, afternoon drinks, and of course, people watching! :) Inside, we loved the classic charm mixed with modern touches (especially the wallpaper + plaid duo in our room!). A place where you feel like family from the moment you walk through the door, we ended up having wonderful conversations with staff each time we came and went. Don’t miss: the chocolate chip cookies that magically appear in the Guest Pantry around 7pm. The best treat to come back to after dinner, and made with Saratoga Potato Chips! East Side Historic District | No secret, one of our favorite things to do when we’re exploring a new place is to grab a coffee and stroll the historic neighborhoods. Saratoga is home to some of the most beautiful houses in the area, which will be showcased in this Saturday’s Historic Homes Tour. As luck would have it, we were able to grab a sneak peek into one of the homes on the tour while we were there (150 Phila), and it did not disappoint. We always love seeing people pouring love into old homes now that we live in one ourselves! Don’t miss: the tour, of course! If you’re in town, grab your tickets for Saturday’s tour here. Broadway and Congress Park | The main street of Saratoga, Broadway is filled with coffee shops, restaurants, boutiques, and so much more. You could easily spend an entire morning (or an entire day!) perusing the shops, and when you need a break, wander through Congress Park (designed by the same architect that planned Central Park!) and claim a seat on one of the benches overlooking the pond. Don't miss: a couple of our favorite shops - Northshire Bookstore (something about being able to walk through a good book store every once in a while!) and Caroline and Main for the cutest clothing from some favorite brands like Joules and Wooden Ships. Coffee | Saratoga Coffee Traders | Home of Death Wish Coffee and just a few doors down from Saratoga Arms, this was the perfect spot to grab coffee before a stroll downtown. Breakfast | Saratoga Arms | We both ordered (and happily finished!) the breakfast sampler, and I'm still thinking about those corn cakes. The most delicious spread! Lunch | Farmer's Hardware | A favorite since it opened last year, Farmer's Hardware is our go-to spot for lunch when we're in Saratoga. We were psyched to see that they added the Impossible Burger (a plant based burger) this year, and like everything else on their menu, it did not disappoint! Don't leave without: trying the sweet potato tots! Perfect with spicy honey. Dinner | Henry Street Taproom | After a pretty big lunch, this was the perfect casual spot for a few appetizers and drinks. We're excited to head back with a bigger appetite, since the Maple Brown Sugar Bread Pudding (with salted maple caramel!) sounds right up my alley. Looking for more to do in the area? Check out our Glens Falls Travel Guide here! 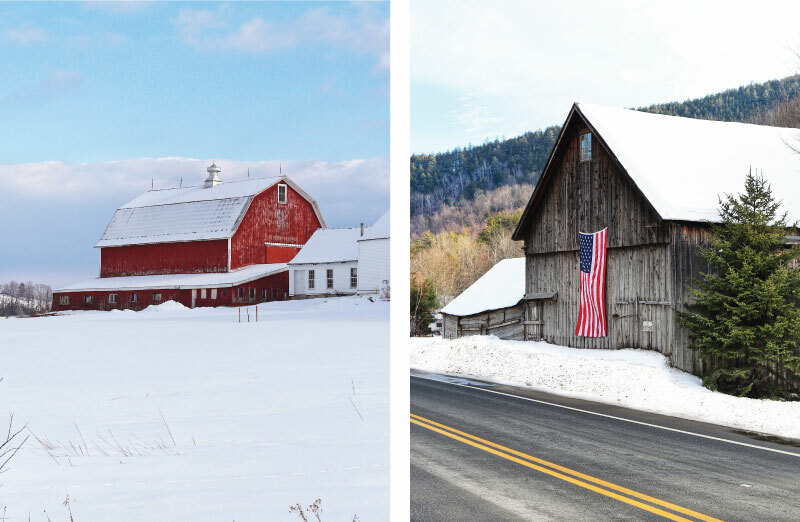 It should come as no surprise that one of our favorite spring getaways (okay, really any season) is heading to Woodstock, Vermont. A quick 90 minute trip brought us to the doorstep of the Woodstock Inn, and we couldn’t have been happier to see the smallest hints of spring when we arrived. Although we were a liiittle early for the tulips (they should pop up within the next week or two, if you’re going! ), we still lucked out with an entire afternoon of sunshine and 65 degree temps. So basically heaven after the winter we’ve had. For this trip, I was excited to put my Dooney and Bourke duffle to use for the first time. I’m typically a weekender bag kind of girl, but I always end up needing to use another tote or two to fit the bulkier stuff, like shoes, hair dryer, etc. The medium duffle was the perfect size for everything - no extra bags needed (and for those of you that pack a bit more efficiently, they do have a smaller version here!). We’ll definitely be putting this beauty to good use on all of the long weekend travels we have planned this summer! We’ve gotten comfortable in our well-loved routine in Woodstock, since it’s one of those places that feels like home to us. Here are some highlights from this trip (much the same as others..see posts here and here! ), and as always, I’d love to hear any of your favorites that we should fit in next time. Woodstock Inn | One of our all time favorite places to rest our heads in New England, it also houses two of our favorite restaurants in town - The Red Rooster and Richardson's Tavern. Can't wait to head back this summer to claim a white Adirondack chair on the front lawn and sip Rosé for the afternoon. Don't leave without: spending a morning at The Spa. We missed it this trip, and I'm still kicking myself. Don't leave without: heading downstairs to the workshop to watch the glassblowing up close (and stepping outside to grab a photo of the waterfall flowing under the covered bridge!). Covered Bridges | Our favorite to stroll over by far is Middle Bridge, just across the Village Green from the Woodstock Inn. This trip, we finally stopped to snap a few photos at the Taftsville Covered Bridge - one of the oldest covered bridges in Vermont! Village Green | And of course, it wouldn't be a trip to Woodstock without a stroll around the Village Green and the neighborhoods beyond, dreaming about which one we'd pick if we ever moved here. Woodstock Farmer's Market | Typically our last stop on the way out of town, this time we grabbed some fresh flowers (they have the best selection! ), and a big bag of maple kettle corn for the ride home. South Woodstock Country Store | We've never been down to South Woodstock, so we made a point to take a ride there this trip. We stumbled upon the cutest country store nestled amongst old Federalist homes in a historic little village. Don't leave without: spending a half hour on the front porch, enjoying a homemade cookie or two. Many thanks to Dooney and Bourke for sponsoring this post. I’ve loved Dooney since getting my first bag in high school, and have long admired their classic American style, New England roots, and commitment to quality (hence why there are so many vintage Dooney and Bourke bags in great shape!). All opinions expressed are my own. With more freezing rain and cold temps predicted for early last week, we finally cried uncle. We knew we wanted to head for the Charleston area for a little charm and a taste of spring, but totally balked at the expensive last minute flights. We don’t shy away from a long road trip, so we knew we’d drive - BUT - with a 14 hour trip ahead, breaking it up into two parts (and exploring a new place on the way!) sounded pretty appealing. After so many amazing recommendations on this post (thank you!! ), we finally settled on Old Town Alexandria since it was perfectly half-way. Well, and because once I saw all those American flags and old brick sidewalks, I was sold. With only about 36 hours to play with, we didn’t even scratch the surface here, but if you’re interested, read on for where we strolled, stayed, dined, and played on our quick trip. Can’t recommend it enough as a stop on your road trip south or as a destination on it's own! The Historic District | Brick sidewalks with 19th century gas lamps lighting the path, cobblestone streets, arched gates leading into perfectly manicured gardens, American flags waving in the breeze, and original antique door knockers on every door. There was a photo opportunity around every corner here, made even better by the lingering cherry blossoms and wisteria! Don’t miss: Captain’s Row (the 100 block of Prince Street) with the cobblestone street leading right down to the waterfront. Morrison House | Always on the lookout for a charming, historic inn, I stumbled upon Morrison House early in my search and we loved it. While we didn’t have much time to linger there, the location was perfect - tucked right into Old Town’s historic neighborhoods and just a block from King Street. Don’t miss: enjoying a cocktail on the patio out front, admiring that classic Federal style entrance and fountain. Coffee | Killer E.S.P. | Right around the corner from Morrison House, how can you go wrong when E.S.P stands for Espresso, Sorbet, and Pie?! We loved this casual spot, and especially loved how dog friendly it was - we met so many pups inside! Brunch + Drinks | Virtue Feed and Grain | Right near the waterfront, the outdoor patio (and the mimoas) were perfection on a sunny day. Bonus points for the historic brick building - a feed house from the 1800’s! Dinner | Hank’s Oyster Bar | We ducked in just as two seats opened up at the bar, and loved the New England vibes (and the Goldfish to snack on while we perused the menu!). Don’t miss the lobster roll or the key lime pie. Nationals Park | Is there anything better than overpriced beer, popcorn, and a day at the ballpark? It ranks pretty high up in our book, and although we’re Mets fans, we don’t typically pass up an opportunity to take in a game when we find ourselves in the vicinity of a major league park. As luck would have it, the Nationals were home while we were in town and we were able to snag some last minute tickets on Stubhub. Don’t miss: catching the boat (!!!) to the game from the dock just a quick walk from our hotel. Avoiding all traffic and parking woes AND a bar (okay, a cooler with drinks for sale) on board was a huge win. On our list for next time: Sugar Shack Donuts, Brabo Tasting Room, Vermilion, Magnolia’s on King, shopping at The Hour, Book Bank, Home on Cameron, Red Barn Mercantile, touring Mount Vernon Estate, and so much more. Would love your additions to the list if you’re local! 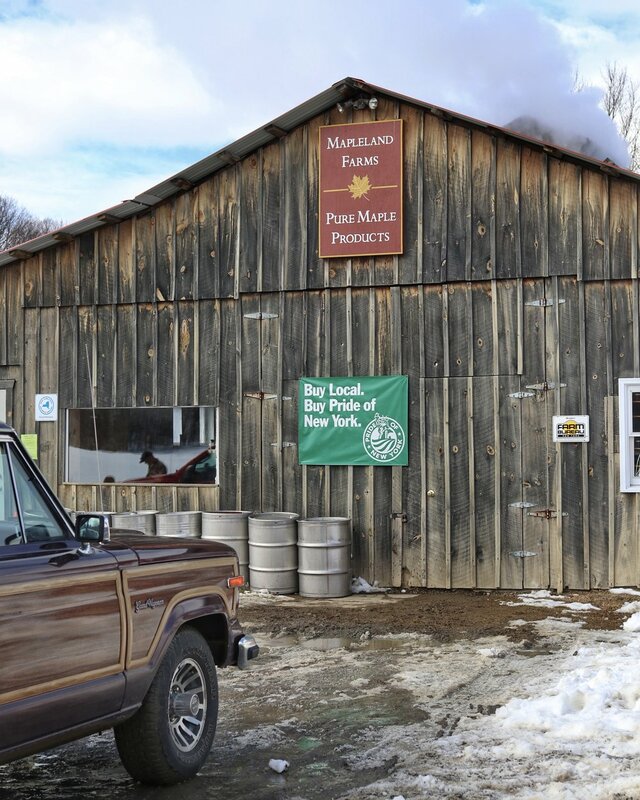 Vermont typically gets all the love when it comes to maple syrup, but we're lucky to have a long list of amazing maple farms right here in our own back yard! And this time of year, when it's spring but not at all feeling like it, a little road trip and a lotta maple is pretty much the best thing to beat cabin fever. So, if you're up for something sweet, here are a few of our favorite upstate sugar shacks to visit! 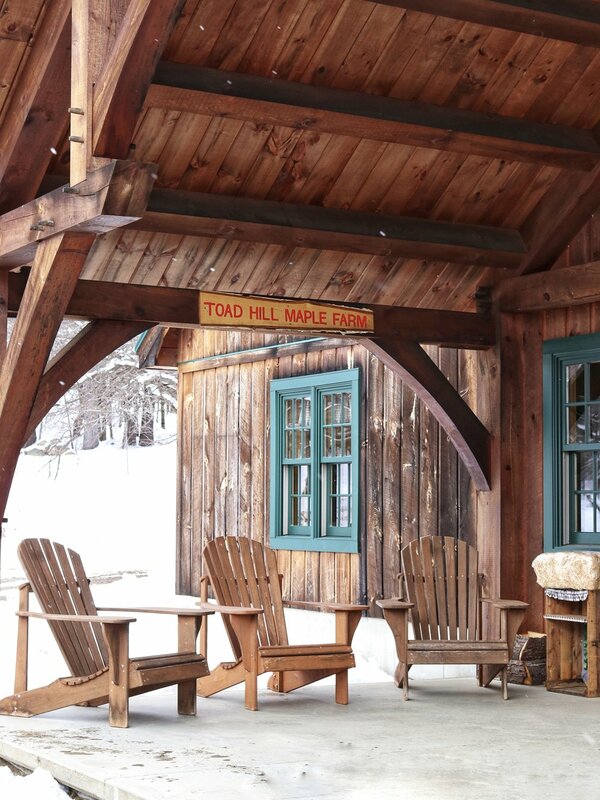 Toad Hill Maple Farm | Athol, NY: The largest of the bunch, the timberframe sugar house at Toad Hill is a beauty. Bonus points for the covered bridge on property, and the wagon ride that takes you over it and through their sugarbush! Don't leave without: an enormous bag of maple popcorn, along with the biggest maple leaf bottle of syrup you can buy. Maple Knoll Farm | Minerva, NY: A most charming sugar house (made with lumber milled from trees on their land! ), and the loveliest people. We felt right at home as soon as we walked through the door, and left with a handwritten recipe for maple dip - it doesn't get much better than that! Don't leave without: sampling one of their maple donuts, topped with maple dip (grab a jar of maple cream to make your own dip - so good!). Rathbun's Maple Sugar House | North Granville, NY: A local favorite, it's hard to believe it was our first time out here! A horse drawn wagon greeted us out front (along with the smell of maple wafting through the air!) and we loved watching them boil sap into syrup from above in the sugar house. Don't leave without: devouring their pancake breakfast. The wait was over an hour when we got there, so we'll be back next weekend! Don't leave without: a bag full of their maple candy (it melts in your mouth!) and a 'gram of the syrup samples in the window, of course. Sugar Mill Farm | Greenwich, NY: A classic red-roofed sugar house just outside one of our favorite Washington County towns. Save room for their pancake breakfast, which folks were lining up for when we arrived! Don't leave without: a jar of their maple cream. Someone has been eating it by the spoonful. Ahem, Tom. If you're not local, you can purchase online from most of the farms mentioned above, as well as our pals at Bixby's Best in Bolton Landing! Upstate friends - would love to know what your favorites are! Happy Spring! Allow me to introduce you to Glens Falls - where small-town charm meets big (okay, little) city living. Given the title Hometown, USA by Look Magazine in 1944, the editors described Glens Falls as the typical US hometown that "contained, in microcosm, every aspect of the American idea." And that heavy dose of history and Americana is what we love most about it. We’ve called the city home for the past 7 years (or forever, since I grew up just over the river). No matter where we travel, we’re always happy to come back home. So, it’s high time we put together a travel guide for our own home town! If you ever find yourself in our neck of the woods, tucked between Lake George and Saratoga, come on by! When you do, here are a few of our favorites to get you started (and if you're here in the warmer months, view our summer guide here!). Roasters, you won’t be disappointed. Great breakfast + lunch options, but you'll usually find me with a cronut or maple scone, and Tom with a Bulletproof coffee. Juicin Jar: Our favorite little spot for freshly pressed juice and fruit smoothies. The very freshest menu, best flavors, and lots of vegan, vegetarian and gluten-free options, too! My favorite this week: the Very Berry Smoothie - too good. a quick coffee and bite to eat (which Tom does every day on the way to work), or linger over breakfast on the weekend (get the chocolate chip pancakes!). with a dietary restriction. Vegan, gluten-free, dairy-free, and all taste great (plus, they’re expanding at the same location to offer a fresh and healthy market - can't wait!). Spot Coffee: Another convenient option downtown to drop in, grab a coffee, or have a bite. Open every day until 10pm, they have live music, open mic, and other evening attractions on the menu periodically as well. Tom's fav: the mocha espresso (have you noticed yet that I don't drink coffee?!). Raul's: Our go-to for Mexican and Margaritas! A downtown staple with a location perfect for people watching, you can usually catch us by the windows polishing off chips and guac. Davidson Brothers: Known for their craft beer and pub style menu, the Davidsons played a big role in bringing people back downtown when they opened their brewpub back in 1996. Fun fact: Tom and I went here for beers after offering on both of the houses we’ve purchased in the city, and both offers were accepted! Our own little good luck charm. Downtown City Tavern: Tucked just off Glen Street, the Tavern is a favorite for their rotating craft beer selection and wood-fired pizza. Be sure to top things off with one of their boozy milkshakes if you visit! Street brings you a plethora of hand-made and hearth-baked treats (and don't miss the sandwiches!). Great vegan and vegetarian options here as well! Samantha's Cafe: Conveniently nestled into downtown, this is a great 'gram worthy spot to enjoy their made-to order menu. You must try their “melties” (you can thank us later), and don’t forget the amazing desserts! Cooper's Cave: Pub, beer, and ice cream – the perfect trifecta. Located right on the Warren County Bikeway, it’s a favorite place to pedal to for a Chopped Salad and a cone come summer! Mean Max: Awesome craft beer, dart league, trivia, live music. Enough said :) Grab some take out from your favorite downtown spot and head to the tasting room. Success to these guys is simply being able to share their brews with their friends, family, and neighbors. Common Roots: Just over the river in South Glens Falls, Common Roots is owned by a father-son duo (recently featured in the New York Times!). With a food truck often parked outside, it’s perfectly cozy inside during the winter and even better in the summer with an outdoor firepit and Adirondack chairs. I’m a big fan of their wild ales, and Tom goes for the Last Light IPA every time. Get Outside: We’re so lucky to have Crandall Park and Cole’s Woods in our backyard. Winter offers ice skating on idyllic Crandall Pond, sledding down the hill in Crandall Park, trails to walk the pups through the snowy woods (Murphy and Max’s favorite!) and cross country skiing and snowshoeing in Cole’s Woods. West Mountain is just down the road for downhill skiing and tubing. If you’re up for a walk, wander the charming sidewalked neighborhoods adjacent to Crandall Park, or admire the architecture of the old lumber baron’s mansions lining the main streets downtown. Stay Inside: If staying warm inside is more your thing, there’s plenty to keep you busy. Glens Falls is home to the exceptional Hyde Collection, which includes works by Rembrandt, Degas, Picasso, and Renoir to name a few. To learn a bit more about the history of Glens Falls, make a stop at the Chapman Museum downtown (and admire the Victorian architecture of the DeLong house while you’re there). If you’re in the market for a bit more action, Glens Falls is home to the Adirondack Thunder (an affiliate of the New Jersey Devils), and home games are played downtown at Cool Insuring Arena. Last but certainly not least, if you're in the mood for a show, check out the upcoming events at the Wood Theatre (and in the summer and fall, the Adirondack Theatre Festival and Adirondack Film Festival!). Where to begin?! Visit Fountain Square Outfitters for Patagonia and outdoor gear, Minky Mink for favorite brands like Free People and Hunter Boots, and Lake George Olive Oil for the very best - you guessed it - olive oil and vinegar. Check out the Shirt Factory and LARAC Shop for the best works from local artists. If you're hunting for antiques, stop by a few of our favorites in the surrounding area: The Fox and the Chicken Coop, and Antiques Market Place. 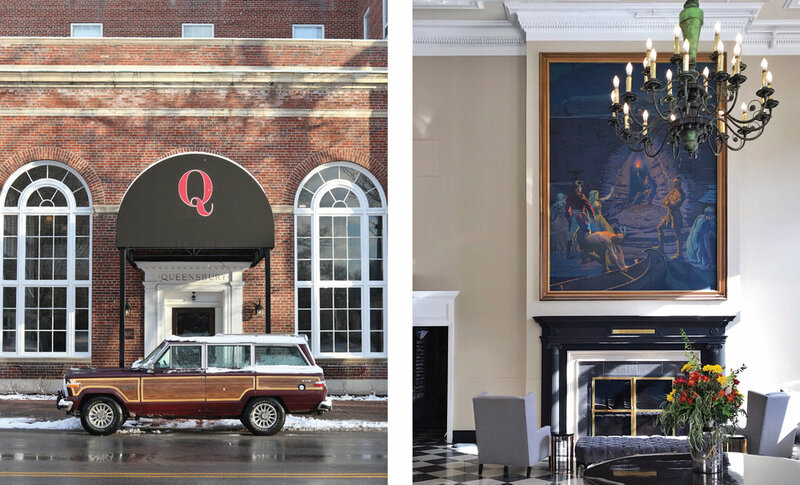 The Queensbury Hotel: Built in 1926, The Q is a member of Historic Hotels of America and is currently in the midst of a $6 million dollar restoration. We’ve loved seeing the character and charm of the hotel renewed with classic touches like marble floors and subway tile. There are two restaurants on site, Park 26 and Fenimore’s Neighborhood Pub, and we couldn’t be more excited about their future plans for a rooftop bar! We hope you have a chance to visit our little city, and love it as much as we do! Local friends, please share your favorites in the comments! Stay tuned for the summer version of the city guide, coming this May! With a name like the Kingdom, it’s no surprise that 36 hours isn’t even close to enough time to do or see it all in this gorgeous corner of Vermont. This region is known for it’s unspoiled beauty, and the quiet, uncommercialized nature of this area is what I loved most about it. When you want a coffee or a quick bite, you’re not headed for Starbucks or McDonalds - you’re popping into the country store or bellying up to the counter at local diner. The views along the hilly country roads in East Burke (Darling Hill Road in particular!) were so picturesque that we found ourselves wishfully searching the real estate listings over drinks the first night. Not only that, but we enjoyed great food, met some wonderful locals, and scored some great finds from local antique shops (at really good prices!). We’ve only just scratched the surface here, and there were so many things we wished we had time for this trip. All the more reason to start planning the next! Inn at Mountain View Farm | Four barns, a big yellow farmhouse, and a Farm Animal Sanctuary with the sweetest horses, goats, cows you’ve ever met (not to mention Emma the donkey!). The Farm is what my dreams are made of, and we could not have loved it more. Mountain View Farm operates as a bed and breakfast from May - October, and lucky for us, rents suites during the winter season. We stayed in the Peacham Suite in the farmhouse, with a cozy fireplace and perfect view of the aptly named Great Barn. Next door, the stately brick creamery building houses more guest rooms, as well as the parlor where breakfast is served in the warmer months. And speaking of warmer months, we can’t wait to return this summer to enjoy cocktails in the Adirondack chairs, overlooking the barns. Peacham Cafe | Peacham: Depending on where you’re coming from, you’ll have a chance to drive through a plethora of charming little towns and villages on your way north. A little research and a few recommendations turned up Peacham (population 732! ), a quintessential Vermont village that was the perfect welcome for our trip into the Northeast Kingdom. Historic homes line the street, with church steeples and red barns dotting the landscape. In the center of town is the Peacham Cafe, where we enjoyed a great lunch surrounded by the friendliest locals. Main Street | St. Johnsbury: We had multiple recommendations to check out the Fairbanks Museum, and while we didn’t have time this trip, we did want to peek at what St. J had to offer! A quick drive down Main Street and loop around Railroad Street turned up lots of classic Victorian charm (the mansions!) mixed with what looked like a fun downtown scene. A few spots that caught our eye: Kingdom Taproom, St. Johnsbury Antiques, Antique Annex, Dog Mountain. Lake Willoughby | Westmore: Often compared to a Norwegian fjord, this beautiful lake is just 15 minutes from the Inn. After grabbing a coffee in town, we took a quick drive up and around the lake, watching as the ice fisherman made their way out onto the lake with their shelters. The water is crisp and clear in the summer, and we can't wait to come back to paddle the lake (rent kayaks and canoes here) and hike Mount Pisgah in the warmer months. Antique Shopping | Lyndonville: We loved exploring the village of Lyndonville (especially their version of the Painted Ladies overlooking the park! ), as well as popping into some of the local shops, including Antiques & Emporium and Green Mountain Books & Prints. On our list for next time: Fat biking + snowshoeing on the Kingdom Trails, skiing at Burke Mountain, and heading north to explore the town of Newport (which we got many recommendations for!). Burke Publick House | East Burke: We enjoyed some local craft beers at the bar as we watched the skiers file in in after a day at Burke Mountain. They’ve got a cool, friendly rustic atmosphere with live tunes and all the sports games you can stay tuned into. Juniper's | Lyndon: Classy, casual atmosphere with an great dinner and dessert menu (Mountain of Cookies sundae!) and an amazing view to boot! Looking forward to coming back and grabbing a table on the patio this summer! Cafe Lotti | East Burke: Great coffee = road trip necessity. Café Lotti didn't disappoint with a variety of specialty coffees. Hot or iced, they’ve got you covered. (Tom grades the Mocha espresso an A+). Miss Lyndonville Diner | Lyndonville: If you're looking for a good old fashioned diner breakfast, this is the place! We bellied up to the counter for omelets, and of course, a side of pancakes to share. Auntie Dee Dees | East Burke: A must! Fresh bread and sweet treats, quite literally home made (the bakery is attached to her house!). Get here early - these goodies sell fast! We grabbed some cookies and a lemon bar for the ride home, but the cinnamon buns and bread looked amazing. Northeast Kingdom Country Store | East Burke: Right downtown in East Burke, the country store was built in the mid 1800’s and has been recently renovated into an amazing spot for a bite to eat and local shopping (pottery, crafts, antiques, maple syrup, wine...!). On our List for Next Time: Burke Mountain Confectionery - we heard great things about the truffles! Until next time, Mountain View Farm! You'll see us again this summer, for sure! *This trip was in partnership with the Vermont Department of Tourism. Thank you to the Inn at Mountain View Farm for welcoming us as their guests. As always, all opinions are my own. If you’ve been following along here for a bit, you might remember that last January I professed my love for a new to me app that’s been a game changer for me when it comes to documenting the everyday. And now I’m back this year to tell you - I love it even more. I included a run down of the One Second Everyday app in last year’s post, so check it out here if you’re thinking about giving it a try (and please give it a try - you’ll love it!). But to make a long story short, I recorded one second of video, every day, through all of 2017. The good, the bad, the boring and the exciting. And it’s truly my favorite thing ever. I’m not the greatest at documenting the little things (well, except those 8,000 photos of our dogs on my iPhone). I can look back at a year and pick out the highlights - exciting life events, a fun vacation - but what about the average day? What did we binge on Netflix? What house projects were we working on? What was our go-to weeknight dinner? And that’s where this little app comes in. I’m admittedly a bit lazy when it comes to creating something tangible with my photos. I’ve got 10,000+ photos on my iPhone at any given time and not a printed photo or photo book to show for it (working on that this year!). BUT, perhaps because it’s so easy and so restrictive (just pick ONE second! ), the One Second Everyday app is something that has just stuck for me. I honestly can’t picture a year without it now that I’ve started (and I can’t help but wish I had started doing this years ago - what were we even doing in 2013?!). Can’t wait to see what 2018 brings! And friends, would love to know if you tried this out for 2017, or if you’ll be doing it for 2018 (start now! ).